WMSPanel is a SaaS which handles statistics of hundreds of media servers from hundreds of customers of various sizes from 59 countries around the globe. So we can feel the pulse of media streaming and have some general slice of the industry. The most interesting metric from heterogeneous set of servers is the transmission protocol used for media delivery to viewers. So we'd like to share what picture we have for media protocols today for June and July of 2014. It is based on metrics of 970 servers running Wowza Streaming Engine (versions 2.x through 4.x), Nimble Streamer or Windows Media Services on board. For a given time we've processed the stats about 1.4+ billion views on the servers of our clients. 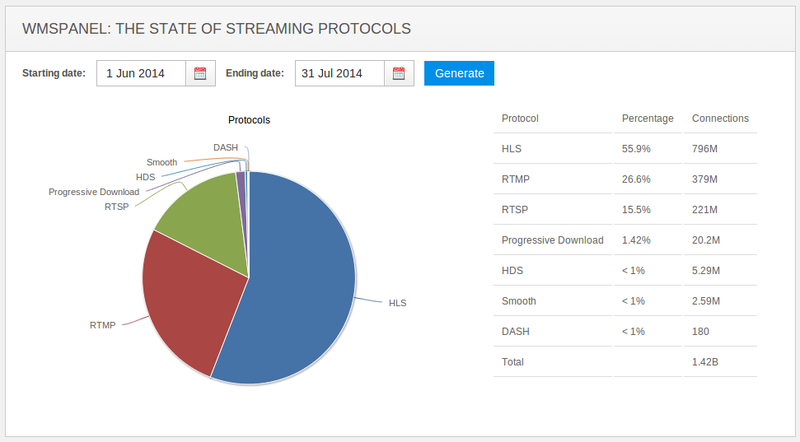 The State of Streaming Protocols: June-July 2014. More than a half - 796 millions of views, or ~56% - is handled by HTTP Live Streaming (HLS). Nowadays it's a de-facto standard to bring media to multiple devices so no wonder it has the largest share. Realtime Messaging Protocol (RTMP) handles a quarter - 379M+, or 26% of views. It's the best protocol for real-time streaming so it's very popular. RTSP, another real-time protocol, handled nearly 221M views with 15% share. Other sorts of protocols like progressive download, HTTP Dynamic Streaming (HDS), Microsoft SmoothStreaming and MPEG-DASH handle the rest which is 27M+ views, or 3% share. So this is quite an expressive snapshot so we'll keep updating our audience about the state of media protocols.